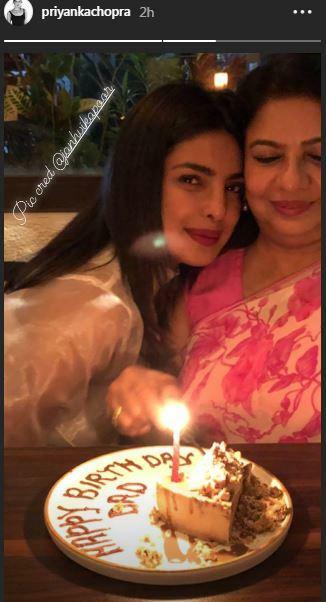 'Daddy's lil girl' Priyanka Chopra celebrated her late father Dr Ashok Chopra's birthday by stepping out for a dinner outing with mom Madhu Chopra. The 36-year-old took to social media to share a picture, clicked by 'Dhadak' star Janhvi Kapoor, in which the mother-daughter duo can be seen cutting a piece of cake. Earlier in the day, the 'Quantico' star shared a short video clip with photographs of her father on social media and captioned the post: "Dad. You are so missed. Happy birthday. Always and forever." On the work front, Priyanka will next be seen in Hollywood movies 'Cowboy Ninja Viking' and 'Isn't it Romantic'; while in Bollywood, she will play a major role in Shonali Bose's 'The Sky is Pink'. The 'Mary Kom' actor recently made headlines for her engagement with American singer Nick Jonas.